Political uncertainty has now a new partner: monetary policy uncertainty. EUR/USD bears may continue leading the way next week but further slides at doubt. It was not a good week for the greenback, but the EUR didn't get to regain much ground against its American rival. The pair remained capped by the 1.1400 level, as European currencies' gains were limited by political woes. The back and forth around the Italian budget was the main drag for the common currency, also affected by Brexit uncertainty. So far, Italy hasn't been able to get the EU approval on its budget. On Thursday, the EU governments' representatives supported the EU Commission in its will to impose disciplinary actions on Italy, so far unannounced. Early Friday, an Italian newspaper reported that PM Conte and FM Tria are working on a proposal to cut deficit target and assure Brussels that it will not exceed the 2% level, involving delaying welfare and pensions reforms, although the positive headline didn't reach trading boards. EUR's weakness could also be attributed to macroeconomic data, as inflation in the Union slid to 2.0% YoY in November, according to preliminary estimates. Core inflation printed 1.0%, below the previous 1.1% although in-line with the market's expectations. German inflation released earlier this week was also softer-than-previously, with the decline in CPI attributed to falling oil prices. The greenback appreciated, despite fundamental news were no better. Not only data came in below expected, but also the Fed's head, Powell, surprised the market with a dovish outlook about future rate hikes, by stating that rates are "just below" neutral, a month later of saying that there was a "long way" ahead of such level. His words triggered a temporal dollar's sell-off, but only the Aussie was able to make a relevant move. FOMC Meeting's Minutes released 24 hours after Powell's words. The document showed that policymakers are still determined to raise interest rates next December, also leaving doors open for additional hikes ahead. There are some factors generating uncertainty about the economic outlook within officials, mostly related to global trade but nothing new under the sun. The Minutes also emphasized that the monetary policy is not on a "preset course," and added that they may tweak forward guidance, to adapt future moves to the outcome of macroeconomic data. A couple of soft figures in the US, don't change the big picture. The US economy is doing well, and there's a long way ahead of economic slowdown. Cooling yields are rather a boost to the economy than a drag. In the EU, however, things are not that clear. Beyond weaker inflation and despite no other relevant data were released these days, the economic slowdown is evident. And while the ECB will put an end to QE as expected next month, for sure the path toward normalization is still a long one. That said, political headlines will continue to overshadow everything else. Updates on EU´s growth will be seen next week with the final versions on November Markit PMI, although Friday will be key in terms of macroeconomic releases, as the EU will publish Q3 GDP, while the US will unveil November employment data. Too early to say, forecasts at this point for 205K new jobs added in November, and a steady unemployment rate of 3.7%. Average hourly earnings are expected to have increased by 3.1% YoY and 0.3% MoM, more than healthy levels. The greenback may suffer from the back and forth from central banks and political headlines, but when compared to the EUR, is set to win the battle. The pair heads into the weekly close trading around 1.1340, with a nice weekly doji that reflects the ongoing uncertainty. A lower low and a lower high when compared to the previous week leans the scale to the downside. The pair held above the 200 SMA, but the 20 SMA extended its downward momentum, crossing below the 100 SMA some 250 pips above the current level. 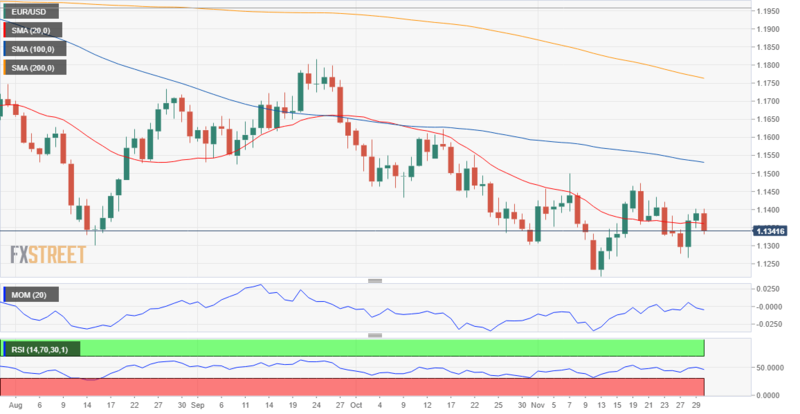 The Momentum extended its retracement after failing to overcome its mid-line falling further into negative ground, while the RSI consolidates around 37, all of which leans the risk to the downside. Daily readings put bears in advantage, as the pair is closing the day below a mild bearish 20 DMA, having spent another week far below the larger ones, as the RSI resumes its decline, currently at 45. The Momentum maintains its bullish slope within positive ground, reflecting the strong daily opening rather than suggesting more gains ahead. The pair is barely holding above the 61.8% retracement of the 1.1215/1.1472 rally, the immediate support at 1.1310 Below it, the next support comes at 1.1215, the yearly low, followed by the 1.1160 price zone. Above 1.1400, the next resistance is 1.1460 a strong static level, ahead of the 1.1500 figure. The FXStreet Forecast Poll indicates that bears will retain control next week, accounting for the 61% of the polled experts, with the average target at 1.1315. Bulls, however, retake the lead in the one and three months views, with the pair seen then back above the 1.1400 figure. The number of bulls increased when compared to the previous weekly poll in both time-frame. The Overview chart is telling quite a story. The moving averages have continued losing downward strength, and have entered a neutral stage. But the same chart also shows that the number of targets above-average increases as time goes by, giving to the 3-month MA a modest upward slope.